Scan Copyright © William Bird (Edge and corner wear) on Flickr. All rights reserved. The 1934 extension of U.S. Route 70 that made it a coast-to-coast highway shows the difficulty encountered when trying to send a major road through the west and keep the numbers in proper order. With the limited number of mountain passes available especially coming into the greater Los Angeles area, from Globe, Arizona westward, Route 70 was always co-signed with the already-existing Route 60 or even north-south Route 99…and, sometimes, both. In retrospect, either Route 70 should have never been extended or Route 60 should have been laid out further north after Show Low, Arizona, thus allowing Route 70 along with Route 66 to be the major east-west servants of Los Angeles. Of course, none of this "roadgeekery" mattered to the U.S. Highway 70 Association. Their concern was convincing people in the much more populated east and mid-west to get on "their" road to spend money on their long drive to Disneyland…and never mind that Route 70 ended in Los Angeles, not Anaheim to the south where the Magic Kingdom actually sits…and, also never mind that, despite the association’s promotion, Route 60 or Route 99 always got top billing. 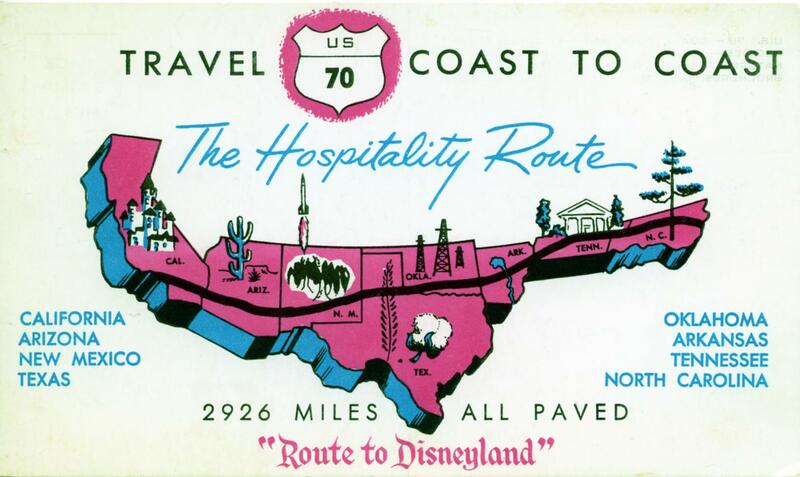 Because of that top billing, there’s not much nostalgia for Route 70 in California today. Parts of old 60 and 99 are now California State Routes under those same numbers which, along with historic route signage, helps people remember the old system. However, when California’s "Great Renumbering" came in 1964, there was no room or need for a 70 along its old shared path, so it was assigned to another road in Northern California that was actually related to old Route 40. All that being said, I’m sure a lot of people, especially from the south, took what they saw as Route 70 all the way to California and always had that association between the two. Besides, Route 70 is still a major highway where it still exists. In fact, I think it might be a good idea to resurrect the old U.S. Highway 70 Association and give it the new nickname of The Waffle House Highway…because, just like the restaurants, Route 70 goes no further than Arizona. Posted in 1950s, Retro/Vintage, TravelTagged advertising, Americana, illustration, mapBookmark the permalink.